There was a red compact car parked in the back of the north school building. It was a model from four or five years ago, and of cheap design. It had a number of small scratches, and its tires were worn bald. Because of several days of rain, the hood and roof were dirty, giving the domestic car an even more seedy appearance. “That’s a car I’m not used to seeing,” said Kaname Chidori, looking down at the compact car from a window in the second floor corridor. “It is?” replied her classmate Kyouko Tokiwa, who was standing next to her. They had stopped on the way back to their classroom after returning a book to the library. It was lunchtime now. Normally, you could see the shapes of students playing ball in the back of the building, but not today. That was probably because second semester mid-term exams had started the day before. Many students now filled the classrooms, fighting with textbooks and notes. Kaname and Kyouko turned back towards the second year group four classroom without giving the car a second thought. Later, the two girls opened their textbooks, discussing the questions for next day’s midterm. The school bell chimed over the intercom. 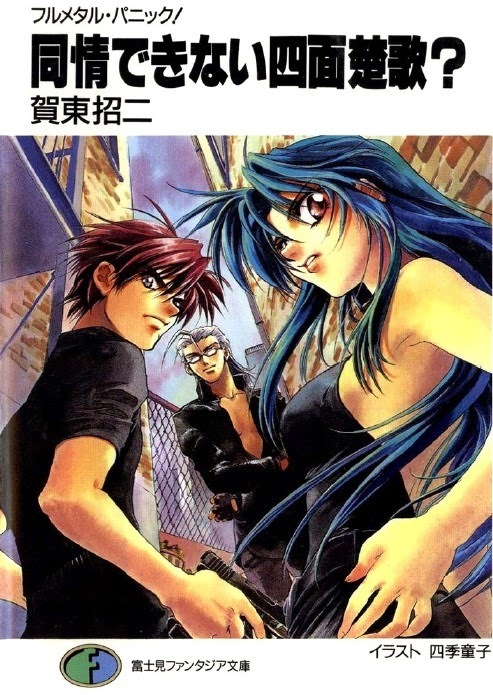 The voice belonged to Sousuke Sagara, who was in the same class as Kaname and Kyouko. They looked around, but couldn’t see him in the classroom. After carefully repeating the license plate number three times, he silenced the speaker. It was just like an announcement you would hear at a department store or some other place, calling out to the inconveniently parked customer. She didn’t really understand what was going on, but the announcement was probably being heard in the staff room and the principal’s office. As such, the owner of the car would probably get in touch with Sousuke right away. So there wasn’t really a problem. Thirty minutes later, Kaname and Kyouko were continuing their studying. “Now, what’s the meaning of ‘In spite of~’?” asked Kaname, pulling the question from the sentence structure of an English text.